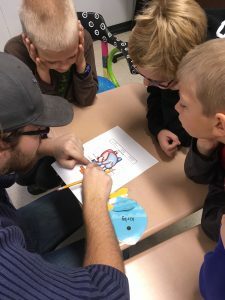 Faculty, staff, and undergraduate students from Michigan Tech’s Department of Biological Sciences led Physiology Understanding (PhUn) Week activities last week for LeAnn Larson’s 4th grade class at the E.B. Holman School in Stanton Township. 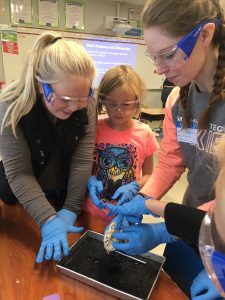 PhUn Week is a nationwide outreach program organized through the American Physiological Society (APS) aimed to build connections between scientists and their local K-12 schools. 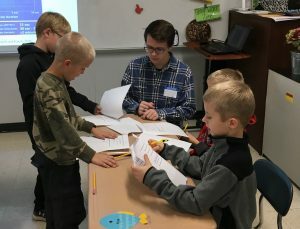 The events were organized by Dr. John Durocher with the assistance of several outstanding undergraduate students, including: Cassie Cecchettini, Erin McKenzie, Justin Mitchell, Chance Sherretz-Hayes, and Colleen Toorongian. Some of these students are part of the new Alpha Epsilon Delta – Health Preprofessional Honors Society at Michigan Tech. Dr. Durocher also particpated in the exercise to show proper wall squat form (and to have some fun)! On Tuesday, students learned about careers related to physiology from Dr. Durocher. 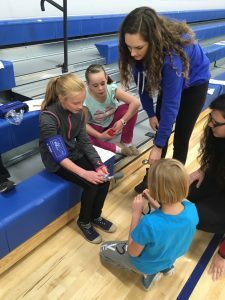 Undergraduate student volunteers then helped teach the students how to take vital signs, such as blood pressure and heart rate. On Wednesday, students formed their own hypotheses about physiological responses to several different types of exercise. Then they hit the gym to test their hypotheses by using the techniques they learned the previous day. 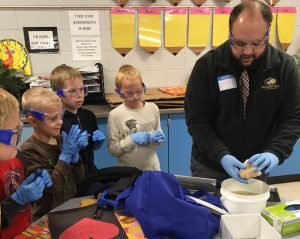 On Thursday, Travis Wakeham (Laboratory Supervisor) led students through a heart dissection. Afterwards, Dr. Durocher demonstrated how he measures aortic blood pressure on the school’s principal and several students! Students had a lot of fun while learning about possible careers and how their own body works throughout the events. They each received a bag filled with a physiology coloring book, scientist trading cards, and a foam heart provided by the APS. Students learning heart anatomy through a dissection. Chance teaching students how blood flows through our heart. Erin and Colleen teaching students how to measure the blood oxygen saturation using a pulse oximeter. Justin helping students calculate their heart rate zones for an experiment.